When March hits 21, it means we’re at the beginning of spring, halfway between the shortest day of the year and it’s longest. It also means that the soccer leagues in Europe are entering their final stages. And as the Champion of each league is getting closer and closer to it’s final identity, some new names who haven’t won in a while or at all, and some of the same ol’ same ol’. During this season, like each season, we come to know some new faces who shock us with their ability to put the ball in the net, names that haven’t been in the headlines in prior seasons. So here we are, writing about those players who have made a name for themselves this season for putting the ball in the net and hopefully will be with us for years to come. 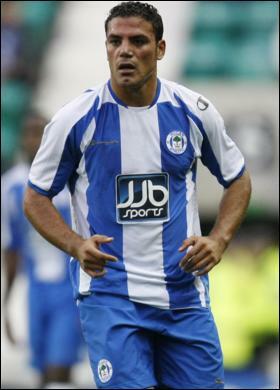 This 25 year old striker came out from complete obscurity to most non-Egyptian football fans this season, scoring 11 goals in his first 15 games for Wigan. 10 came in League play, but an injury has slowed him down since 08′ turned to 09, but still, Zaki has made a name for himself in the Premiership and among football fans from all over with his power and lethal finishing in the beginning of the season. While still owned by El Zamalek of Egypt, be sure that Steve Bruce will open his check book to keep Zaki at the JJB stadium. Gignac did score 9 goals for Lorient 2 seasons ago, but no one expected his leap this season, especially after his dismal number of 07/08, a season that saw him score only twice in 28 games. Elmander leaving to the Premier League gave Gignac a firm spot in the first team, and he took it with two hands. He has scored 17 so far this season in 28 games, leading the scoring charts in France and with Toulouse in touching distance of a title, this young and rising star who has also been called up to the French national team could find himself being crowned player of the year and being on many managers watch list for the near future. Well, Hoffenheim itself is an amazing phenomenon, but Ibisevic is the big story in Germany this year. This 24 year old Bosnian started his career as college star in the United States, playing for St. Louis University, which brought him to P.S.G, but his career never took off there, so he moved to Dijon and then to Aachen, but never managed to show real star quality potential. But this season, his second with Hoffenheim and his debut in the Bundesliga has been amazing so far. He has scored 18 goals to date, leading the scorers in Germany despite not playing since December, which makes his numbers more impressive. Despite finishing the season due to a training match injury in January, Ibisevic will undoubtedly be one of the best memories from this season and probably a top transfer target when he recovers. El Hamdaoui is on his way to bring the title to Az for the first time in 28 years. Az will be the first team since that 1981 Az team to win the Dutch title not called Ajax, PSV or Feyenoord. Van Gaal built a fantastic team in Alkmaar, and El Hamdaoui is his cream of the crop. The dutch born Morocco International did show some promise in his early footballing days, scoring 32 goals in 74 goals for Excelsior, most of them in the second division. He did attract interest from Tottenham who eventually purchase him but El Hamdaoui didn’t manage any Premier League minutes with Spurs. He was loaned to lower league Derby County, but an injury there stopped him progress, and he went back to Holland. Willem II picked him up, and after a good start for them, 3 goals in 6 matches he got injured again. Alkmaar signed him in June 2007 and have never regretted it. 7 goals last season gave a hint about his ability, but this season has been an explosion for El Hamdaoui, with 20 goals in 26 games, leading the scorers in Holland along with superb ability most days, which no doubt bring Hamdaoui’s name to more and more football fans knowledge in the near future.